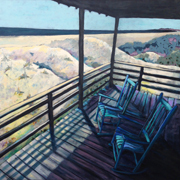 My new painting project, Angles of Repose, explores places of rest, restoration and repose. Because I often paint endangered environments, I chose these, as they seem especially fragile and rare in our hectic and perpetually connected lives. 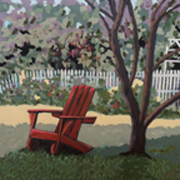 The new paintings include quiet reading nooks, breezy verandas, shady lawn chairs, and lone places by the water. They beckon us to slow down, read, muse and daydream. Most of the pieces are in vintage, hand-painted frames, which adds to their sense of "keep sake." Click on the thumbnails below to view the complete image. Angles of Repose will be on exhibit during the Fall, 2017___1) the Eno River Gallery, ERUUF, Aug 17 - Oct 6 at 4907 Garrett Road, 27705, M-Th, 10-4 and Su 9-1; and ___2) an Open Studio Tour, in my downtown Durham studio, 130 Hunt Street, November 17-19 (F/Sa 10-5 and Su 1-5). I hope you can visit this exhibit. More than forty years ago, I fell in love…with absolute, way-beyond-infatuated affection for a small island in the middle of the Pacific. Mine was Upolu in the Samoan Islands and I was a Peace Corps teacher there. Since then I have returned every decade to visit my Samoan family and rekindle my adoration. During my recent extended visit, when I lived and painted there for 5 months, I witnessed alarming changes in the seas, the reefs, and the winds. I had read that Pacific Islands are acutely vulnerable to climate change, but I had not realized the extent that my village, my family’s land and farm, and our buffering lagoons would be so imperiled. Samoans warn of impending sea level rise, O le ua na fua mai Manu’a (the rain comes for Manu’a) , spoken of a thing long known beforehand, but not yet prepared for. My Samoan kin love their islands, yet they move to New Zealand, Australia and Hawaii as fast as they can go. Ua tagi le fatu ma le ele’ele (Even the stones and earth weep). Exhibiting these paintings feels urgent to me, as if they may capture a special place on the planet and a way of life vanishing to time and tide. 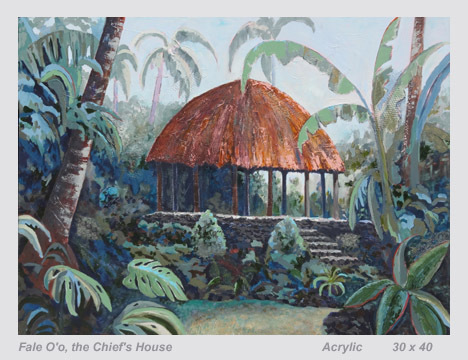 As a Visiting Artist at Golden Belt this past year, I painted each day in gratitude for having known my island and its lifeway, the fa’a Samoa. 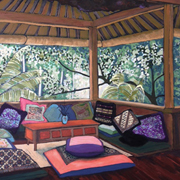 Below are paintings from the exhibit Tender Heart of the Pacific. Graceful undulating and curvaceous ricefield geometry has fascinated me since I first traveled to Thailand many years ago. Since then, I have had the chance to teach at the University of ChiangMai for two year-long assignments and to see ricefields through many seasons. 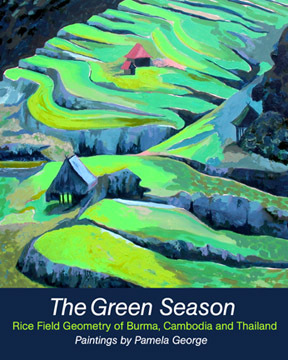 The Green Season, when fields are flooded and the baby rice is planted, is glorious. As the Thai's say, "Oh to be a horse to EAT that color." During 2010-11, while living in ChiangMai, I traveled in nearby Burma, where the highland ricefields on the frontier borders were especially inspiring. Additionally, I visited Cambodia's western and southern regions where flatland fields were flooded in preparation of rice planting. These farms and the village life that has supported them for centuries are full of remarkable crafts and artistry, yet their beauty and longevity are threatened. If Burma and Cambodia follow Thailand's lead toward agricultural mechanization and corporatization, soon the water buffalo will be replaced with machinery and small ricefields that follow the landscapes and the seasons will only be remembered. Click on the thumbnails below to view the whole, complete image. Papua New Guinea is a kind of paradise. Its mountain rainforests are among the most exquisite and fragile places on the planet. Unsustainable logging, farming and mining have put these rainforests and their vast wealth of rare flora and fauna in great peril. 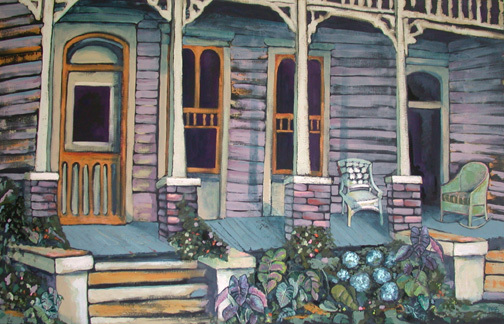 The chance to paint in this extraordinary environment, while it still exists, was my good fortune. In 2008, I was invited to do university faculty development work in Madang on the northern coast of PNG. Additionally, I worked on a research team measuring forest soil carbon in the Adelbert Mountains in the Musiamunat Conservation Area with The Nature Conservancy. The research team was led by my daughter, an environmental scientist. Our research camp was a very remote 4 day trek away from roads, electricity, manufactured goods and broadcast news. The perils of work in this place intensified its importance and its beauty for me. My "paintings" on site during these 2 months were mostly pen and ink drawings. Painting from these sketches were completed in my studio upon return. Some of these are exhibited here on this web site..
Painting the flora and fauna of this rainforest became more and more important to me as I realized how endangered many of the plants and animals were. I am indebted to members of the Musiamunat clan In Madang Province for their keen abilities to find and identify the native specimens I used. Along the Rio Grande, where Big Bend National Park and the Lake Amistad basin are some of our country's most beautiful but least visited national conservation areas, I was a National Park Artist in Residence in 2006. These parks protect amazing Native American pictographs, more than 300 ancient rock shelters and phenomenal flora and fauna. My idea for a North Carolina alphabet was born out of three devotions -- teaching, geography and painting. When I was a beginning special education teacher more than 3 decades ago, some of the students I was teaching had not yet learned to read, even though they were in middle school. Few interesting, attractive materials were available for them. So one of my first successful projects was to create a set of colorful, textural letters using images they designed. Later, in Samoa in the South Pacific as a Peace Corps volunteer, I was teaching geography and had to use a book in which the map of Samoa fell into the book’s gutter -- not to be seen at all! We had to construct our own maps if class was going to make any sense. These experiences and my years of work as a professor of Educational Psychology has convinced me that learning materials work best when they are relevant to students’ lives. As an artist, I love to paint landscapes with flora and fauna. Each design in this alphabet is a landscape of sorts -- a large acrylic painting on canvas full of texture, botanical collage material and light. The letters were designed by Walter Brown, whose marvelous calligraphy danced right onto the canvases. The pure cool and warm colors are ones young children would likely choose, but the complex textures allow many layers of color to peek through. Look for the story of the making of the alphabet in Our State magazine's September 2005 issue. MURAL. 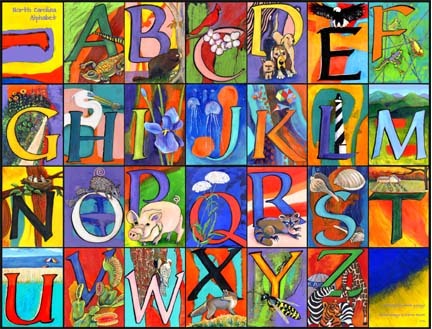 The large 28-canvas mural of the North Carolina Alphabet is on permanent exhibit in the Greensboro Main Library downtown Greensboro, North Carolina. FINE ART PRINTS. A limited, numbered edition of fine art prints of the letters and full alphabet can be ordered. Prints are made with archival inks and museum quality papers and are suitable for matting and framing under glass. During 2005, I had the extraordinary experience of serving as a Fulbright Professor at the University in Male', the capital of the Maldives off the southern coast of India near Sri Lanka. The tsunami happened during my assignment and it swamped homes, schools, and farms of 300 of the 1000 islands. The Maldives is an Islamic state and a seafaring nation and both sets of images filled my canvases there. Curvaceous dwellings, ornamented boat prows, colorful burkhas and Islamic iconography help tell the story of a handsome, brave and proud people whose lives are ever at the mercy of the sea.